Day 16 :: We encounter the Antarctic Convergence where the cold water flowing northward from Antarctica meets the warmer waters of the Southern Ocean. The convergence represents what is perhaps the most significant biological barrier and abrupt transition of climate on earth. 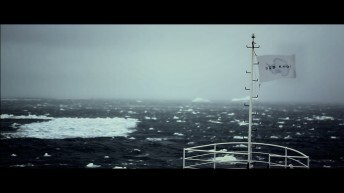 Quite suddenly the emergence of fog, and shifting temperatures, icebergs and sea life usher us through to the Antarctic circle.